Nuclear power makes a nifty metaphor for control versus creativity. Those familiar with this type of energy know it comes in two flavors — fission and fusion. Fission involves splitting the atom and its byproduct is toxic radioactive waste that destroys those exposed to it in painful, debilitating ways. Atom bombs are the stuff of fission. In contrast, fusion is the energy source of the stars and it involves merging hydrogen and oxygen atoms together. Its primary byproduct is water, a life-giving substance necessary to survival. Yes, I know that’s simplistic and nuclear fusion generates some radioactive waste. However, it's a fraction to that of nuclear fission, both in terms of quantity produced and the radioactive life span. And guess what? The metaphor still works. Why? Because creativity is often partnered with change and even welcome change can produce angst, even if it’s accompanied by excitement. If you choose to express your personal nuclear power in a fission-like way, then you’ll bring destruction to yourself and others and leave toxicity in your wake. However, if you choose to live effectively, then your better choice is to express your nuclear power in a fusion-like way, giving it creative expression and amassing life sustenance as its by-product. 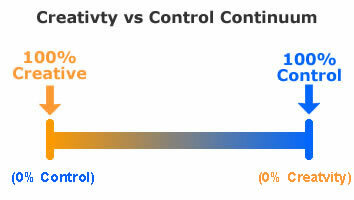 Control and creativity are a continuum, with 100% of either at the extreme ends. The more you seek to maintain control, the less energy you have available for creativity. Conversely, the more you allow your creativity to flow, the less need you have to control. Power gets a really bad rap in our society and for good reason. Too many folks misuse it. Why does anyone seek to control another, though? It’s because they feel a lack of their own power so they try to compensate by taking another’s. The most powerful people, think of someone like the Dali Lama, don’t grab it from others but self-generate it using their own internal fusion reactors. A dandy by-product of living an empowered life is that you automatically tend to foster empowerment in others. The reason why? Because if you live a fusion-like life, then you have the metaphorical equivalent of the energy of the stars. And if you can command that kind of power at your fingertips, then why would you need to take power from others. Guess what the by-product is of empowering others? Opportunities for you to gain ever-greater levels of creativity. That means your star just keeps growing stronger and burning brighter. In my next article, I’ll share a technique Amanda taught me to help me stay in a creative frame of mind. Stay tuned.